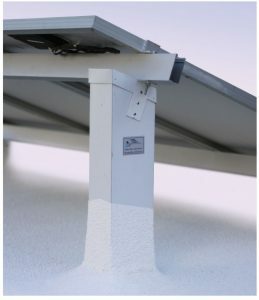 SmartStand is an innovative new solar racking system, manufactured and installed by Central Coating Company – California’s Leader in Sprayed Polyurethane Foam roofing design and installation. With the use of SmartStand racking and a Sprayed Polyurethane Foam roof system, or a fluid applied “Cool Roof” membrane, Central Coating Company can provide a complete solution and solve the challenges faced by other commercial PV installations. The SmartStand stanchion uses a foam‑filled metal tube as a structural support for the Photovoltaic modules. By injecting high density polyurethane foam into a sheet metal tube, we create a composite structure that is far stronger than the sum of its parts. Foam-filled composites are used throughout the automotive, marine, construction, and aerospace industries. SmartStand was inspired by this proven technology. SmartStand stanchions provide a robust attachment between the building and the PV modules. Each stanchion is mechanically fastened to the roof deck. Due to its large footprint and fastening pattern the stanchion does not need to be located above or fastened to the underlying roof structure. This makes for a fast installation and allows the modules to align with the sun, even when the building doesn’t. Each SmartStand stanchion can resist over 600 pounds of wind uplift force. This exceeds IBC and CBC wind uplift requirements with a 3-to-1 safety factor. SmartStand is a more simple and economical solution than most penetrating racking systems. Because the stanchion is the rack, there are fewer parts, lower costs, and faster installations. SmartStand is much stronger than non‑penetrating systems that use thousands of pounds of ballast to secure the module to the roof – a method that puts unnecessary stress on roof structures. The SmartStand weighs just 11.5 pounds per module (in a typical installation using 230-watt modules). 5,10,15 & 20 degree tilt angle with both portrait and landscape orientations are easily accommodated. After being fastened in place the SmartStand stanchion is sealed with polyurethane foam. This provides a durable, waterproof seal – guaranteed. SmartStand is installed by the roofing contractor following the layout provided by the solar designer / installer. The installation of the modules, wiring and connection will be completed by the solar installer. All hardware is included to allow the solar installer to easily attach the modules to the racking. Because the racking is installed by the roofer all penetrations are incorporated into the roof warranty. Most PV modules are designed to last at least 20 years. When designing a PV system the question needs to be asked. “Will the roof last as long as the solar panels?” In the case of most existing roofs, the answer is “no.” If the roof system requires replacement during the life of the modules the entire PV system will need to be temporarily removed to allow for a re-roof. This expense is not accounted for in many payback calculations. SmartStand is optimized to work with SPF roof systems and Cool Roof coating systems. 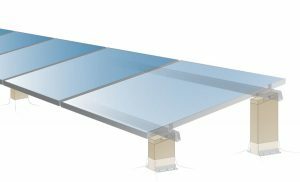 For buildings with existing SPF or Cool Roofs, SmartStand can be integrated into the existing roof. Depending on the roof’s condition, a recoat may be recommended at the time of the Smart Stand installation. For buildings with other types of roof systems SmartStand will be installed as part of the installation of a new SPF or Cool Roof System. Depending on the type and condition of the existing roof, the amount of existing insulation, and the use of the building, CCC will recommend either a new SPF roof or a new Cool Roof system. In either case, the use of SmartStand provides the best, fastest and most cost effective way to install a new roof and racking for a photovoltaic system. A replacement roof system which can be installed over the existing roof system or over roof deck if the existing roof needs to be removed. Provides excellent waterproofing while adding insulation to the building. Each inch of SPF provides R-6.4 of additional insulation which can greatly increase energy efficiency on poorly insulated buildings. Foam can be sprayed to fill in low areas and eliminate ponding water. A renewable roof system. Recoat the roof every 20 to 25 years with no tear off required. The recoat should coincide with the replacement of the PV modules. Long term leak free warranty. SPF roofing is recommended for roofs that are at the end of their useful life or for buildings that are underinsulated, or have ponding issues. A coating system installed over the existing asphalt or single-ply roof membrane. A fluid applied membrane renews the existing roof system and can dramatically extend its life. Depending on the type of the existing roof and its condition the coating system will be reinforced, either partially or completely with reinforcing cloth. Bright white, highly reflective “Cool Roof” coating reduces surface temperatures, saves energy and reduces “urban heat islands”. Fluid applied membranes are a good option for roofs which are not yet at the end of their useful life, but will need to be replaced in several years requiring the PV system to be removed.